Built tough with more power and torque, CASE skid steer loaders boost productivity and increase operator comfort. The cabs feature increased headroom and lap-bar width, along with improved forward, side, rear and overhead visibility. Ergonomically positioned controls, industry-first side lighting and improved reliability and serviceability help you get more work done daily. To deliver CASE performance and productivity to an ever wider range of customers, CASE Construction Equipment has expanded its skid steer loader line-up. The revised range includes six radial lift SR boom skid steers and three vertical lift SV models. The cylinder geometry optimises the skid steer loader’s push and pull power, while the bucket support baring directly on the chassis of the machine further adds to its pushing power. 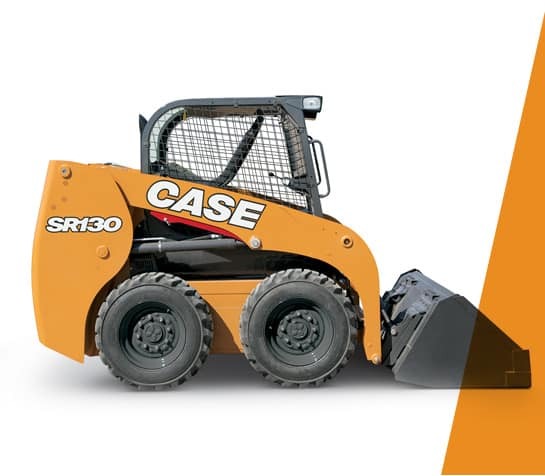 With these features, CASE skid steer loaders deliver best-in-class bucket and lift breakout forces. It’s not just the range that has expanded: all models benefit from a cab with up to 25% more internal width, providing greatly improved operator comfort. Our cab - the widest in the industry - provides plenty of room for comfortable operation, with greater headroom and legroom, more space between the control levers and easy access to the seat. The wide door, repositioned grab handles and a lower threshold provide easy access to the cab. All models have suspension seats and optional air suspension heated seats for the ultimate in comfort. If specified with full cab glazing and door, the cab is completely sealed to reduce the amount of noise and dust. The 89 cm wide cab together with larger windows and a new ultra-narrow wire side-screen provide outstanding visibility all around the jobsite, allowing safer operation. The larger side windows offer visibility over the tyres and the forward cab design provide a clear line of sight to the cutting edge of the bucket improving both productivity and safety. All controls are within easy reach and you can choose between standard mechanical (hand- or foot-controlled) drive levers and electro-hydraulic controls. Electro-hydraulic controls ‘ settings can be modifi ed from the instrument cluster increasing or decreasing machine, boom and bucket speed, or simply making the joysticks more or less reactive. Optional Ride Control provides superior stability and operating speeds, regardless of jobsite conditions. Optional Self Levelling system keeps the bucket parallel to the ground when the loader arm is raised reducing material spillage and making pallet handling easier. With the electrohydraulic joysticks you can set the control pattern to match your preferences, switching between ISO- and H-patterns just by clicking one button. Working longer days even in winter is easy thanks to the unique CASE side lighting system. With just two retaining bolts, the cab is easy to tilt, providing access to hydraulic and transmission components when necessary. A safety locking system that prevents the cab from dropping is automatically activated. Easy access, daily service points grouped together and remote mounted fi lters mean it’s easy to keep CASE skid steer loaders working to their maximum efficiency. Battery and environmental drain hoses are easily accessible from the side of the machine, by removing a tap located behind the rear wheel, allowing quick service and fast maintenance activities.